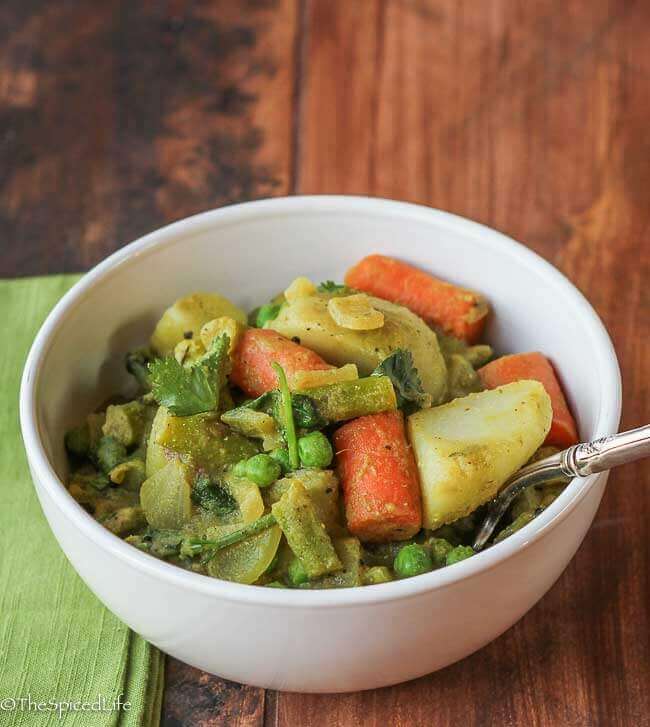 Karnataka Coconut Spring Vegetable Curry (or Saagu) is a delicious regional Indian curry (from Karnataka of course) that can be customized to whatever vegetables are in season. A copy of Vibrant India was sent to me for the purposes of an honest review. 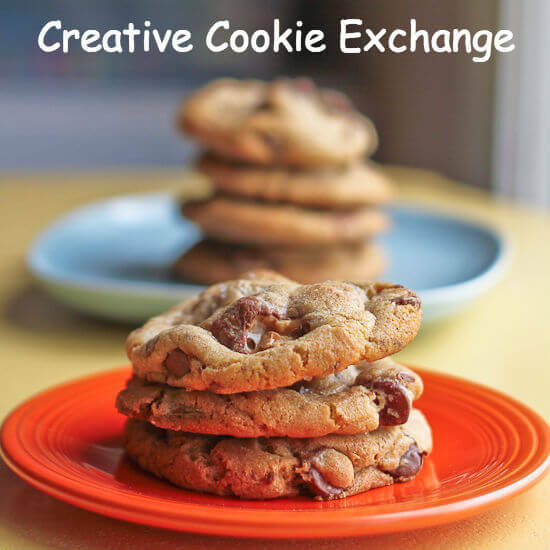 Affiliate links have been used in this post to link to items I am discussing. This dish was a challenge to myself on several levels–but first I want to make clear that reading and cooking from Chitra Agrawal’s Vibrant India: Fresh Vegetarian Recipes from Bangalore to Brooklyn is not remotely challenging. 10 Speed Press is seriously outdoing themselves right now with international cookbooks–I will have more reviews in the upcoming weeks. Vibrant India is a gorgeous yet accessible book (i.e., it is not a coffee table book you will never cook from but it is full of beautiful food photography and high quality production all around). As Agrawal is from southern India, the book focuses on those regions of Indian cooking and is entirely vegetarian. Because she lives in Brooklyn now, her recipes also work in an American kitchen. 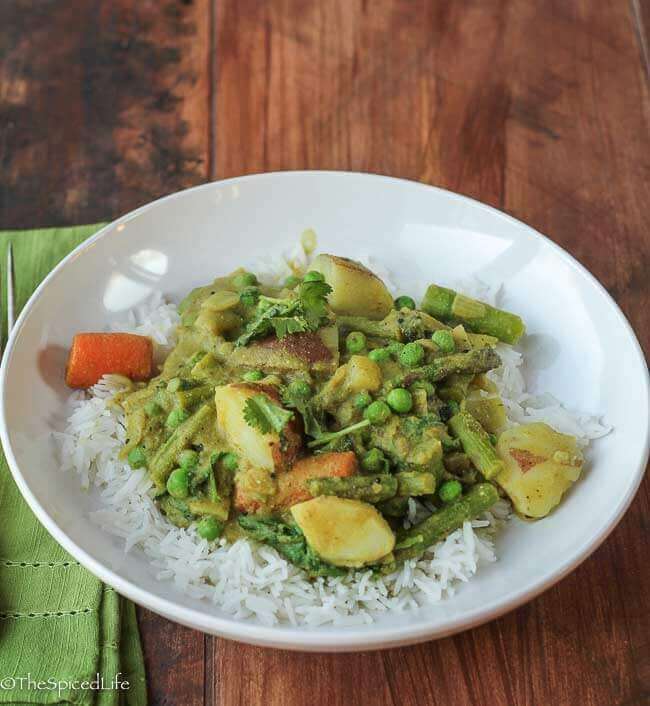 A good example of that is in this Karnataka Coconut Spring Vegetable Curry, which suggests the substitutions of almond flour for roasted chana dal and permits dried coconut for fresh coconut–a swap I confess I have always been afraid to make, thus causing me to skip over a lot of southern Indian recipes. Some other recipes I have bookmarked include Stir Fried Corn with Basil and Leeks; Pineapple and Peppers in Red Coconut Curry; Cucumber, Sprouted Mung Bean and Pomegranate Salad, and if my kids ever catch wind of the amazing flatbread (dosas, steamed rice and lentil cakes, other crepes) chapter, I promise we will be making everything in that section! This is a run don’t walk (to acquire) book–and one I would definitely have paid for eventually without the review copy. 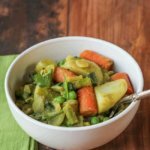 So what made this Karnataka Coconut Spring Vegetable Curry a challenge? Not the actual cooking–that was pretty simple, once it was broken down into three basic steps: making the paste, parboiling the vegetables, and building the curry. The challenge for me was trusting the author that pulverized dried coconut would work in a curry (yes! 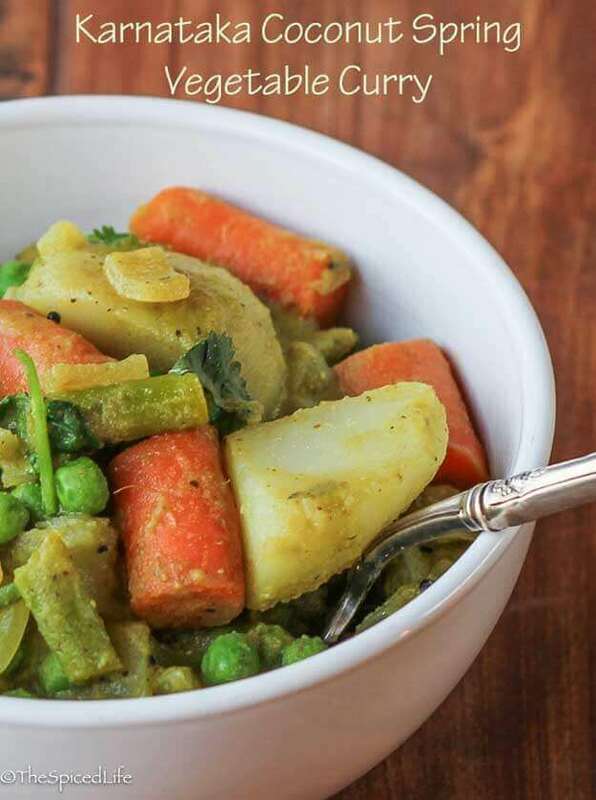 a little different, but the more I ate the more I wanted to keep eating) and trusting that my chosen combo of carrots, potatoes, asparagus and peas would work (once again yes! I am becoming absolutely obsessed with asparagus and potatoes in everything lately). Everyone enjoyed this dish; as I said, the texture was a little foreign at first, but my entire family adores asparagus so much that that kept them eating, and as I mentioned, the more we ate, the less we noticed the unusual (to us) texture and the more delicious the entire dish became. 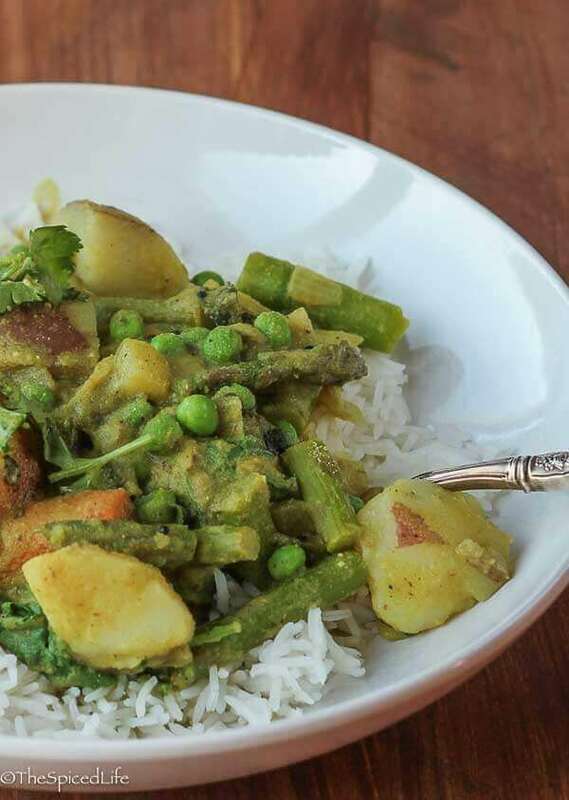 So I would not call Karnataka Coconut Spring Vegetable Curry gateway Indian food, but if you know you like Indian food and you are willing to step outside the box a little, this is a great dish to try! And if asparagus is not your thing (do those people exist? ), try some other vegetables. I think cauliflower would be fabulous, I could see corn and zucchini in the summer months–maybe even with barely cooked tomato wedges added, Agrawala suggests broccoli, and given how tasty the carrots were, I wonder if some winter squash with whatever greens appeal in the colder months might be pretty good. Guys I know I have been a slow blogger this year but I do have some news. We are moving this coming week! To what Sammy calls our Forever Home but which the past year has taught me maybe I should just call our really where we want to be home for now. Or something. So on the one hand, I hope to be getting back into the swing of things in the next month or two, but on other hand I am asking for a little more patience as we once again box everything up and then unpack–this time everything (yay cookbooks!) and try to find space for it all. Stay tuned! Very closely adapted from Chitra Agrawal. I focused on spring vegetables; Agrawal, for example, uses broccoli in hers. I recommend using whatever is seasonal to your location. If you are curious about asafetida, you can read about it here. I highly encourage you to not be put off by its pungent smell (although I do recommend triple bagging it!) because when it hits hot oil the scent is completely transformed. Using a wet-dry grinder (or something powerful like a Vita-Mix), add the whole spices (the first 4 ingredients) and grind them to a powder. If using roasted dal, add it too. Add the ginger and fresh chile pepper. Once again process, this time to a coarse grind. Add the coconut and cilantro, along with enough water to get the blades moving. Blend and then scrape. Add more water if needed and blend again. Repeat until you have a smooth paste. Place the potatoes in a sauce pan with enough water to cover them by about 2 inches. Add a pinch of salt and bring to a boil. If you like your carrots soft, add them now, but I do not. Simmer for 7-8 minutes, until the potatoes are starting to get tender (they will continue to cook in the curry). Add the carrots (if you like them crisp-tender) and asparagus. Boil until the asparagus is becoming bright green but not quite tender. Drain the vegetables, but be sure to reserve the cooking water. Using a heavy bottomed pot, heat it over medium heat. Add the oil with the mustard seeds. Cover the pot, but leave the lid ajar to allow steam to escape. Let the mustard seeds pop; when they slow down, add the asafetida and let it cook for about 1 minute (and take the time to appreciate how wonderful it smells after cooking despite its pungent raw smell!). Add the curry leaves and dried red chile pepper (if using)--stand back because the curry leaves will splatter and pop! When the splattering subsides, which will be less than a minute, stir everything to evenly coat it with oil. Add the onions with a pinch of salt. Let it cook, stirring occasionally, until caramelizing, about 10 minutes. Add the turmeric powder and mix it into the onions. Add the prepared curry paste and stir it into the onions. Let it fry for a few minutes. Add the parboiled vegetables and stir them into the paste. Then add the reserved vegetable cooking water until you like the consistency of the curry--we prefer ours a bit more saucy than dry. Simmer until the vegetables are cooked to your liking. Stir in the peas and cook until heated through (I like to add peas last because I loathe overcooked peas). Taste for salt. A squeeze of lime or lemon juice would not go amiss if you feel like the curry needs brightening. To me this will depend on what vegetables you have used--we did not need it with the asparagus. Garnish with cilantro. Serve with Basmati rice or flatbread like chapatis.